The Granary is a converted barn set on Manor Farm in Brogborough in a secluded location. It is located on the Bedford Road (old A421) and is roughly 1.5 miles from the M1 J13. 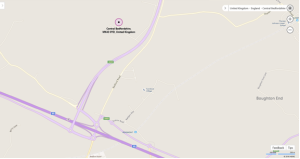  If exiting Northbound, take the fourth exit at the roundabout, over the M1; and at the next roundabout take the second exit (third road) nearly straight ahead towards the Bedford Road (old A421).  You will then go onto a bridge over the new A421 Bedford Bypass.  Follow the farm drive where you will pass two white houses on your right. You will then do a sharp bend to the right, past a house on the left hand side, followed by a left into the farm courtyard. The Granary is then the fourth barn along on the right hand-side. Please drive past the large Granary sign and into the private car park provided at the end if you are attending a course. Please note all other properties are privately owned.